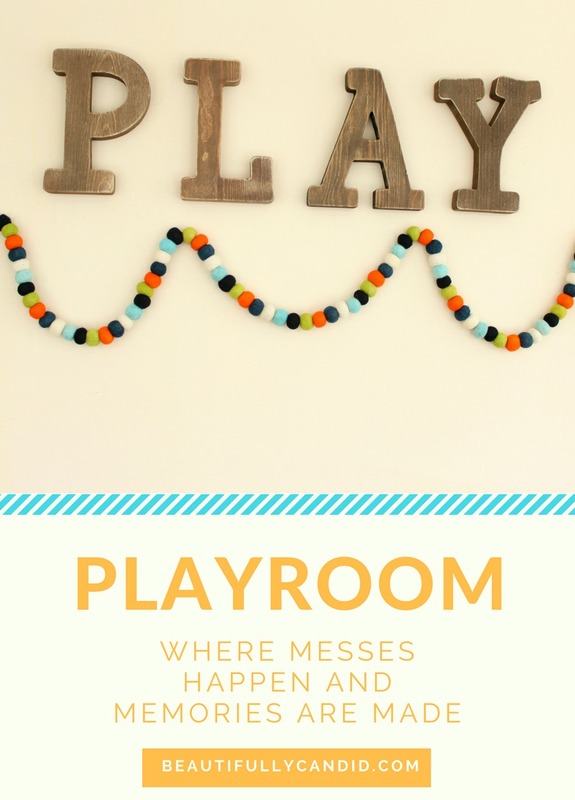 Where messes happen might be an understatement, it's usually more like where every toy bin is dumped out and they're standing on top of the toy box ready to jump off–but that wouldn't exactly fit in my title. 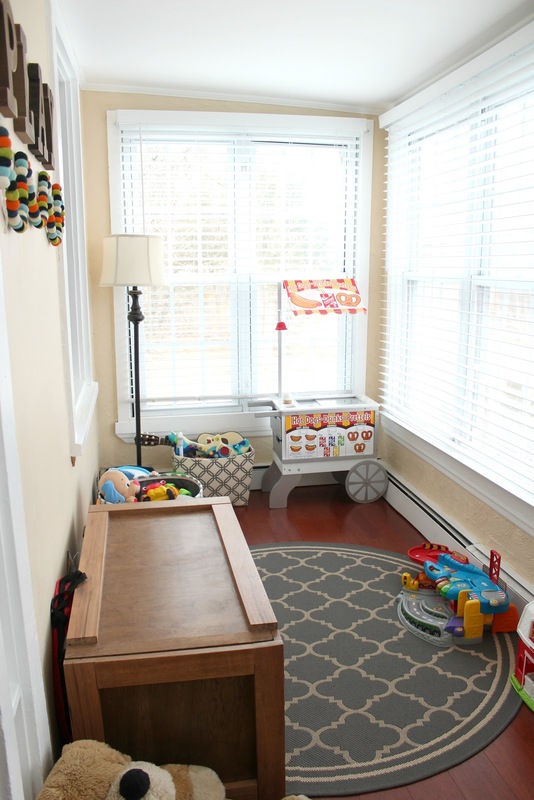 Even though this isn't a large playroom area, we think it might have original been the porch to the house that overtime was finished off, but it serves its purpose. I don't know about you, but I tend to get very overwhelmed around the holidays or birthdays when the toys start piling in. Don't get me wrong, I'm not a scrooge or trying to deprive my nuggets of a childhood, I just know that half of them won't always get played with and then the thought of where are we going to put all of this starts sinking in. As you can see, we have a toy box that my father in-law built for the boys, along with a few storage bins that help with keeping things organized. 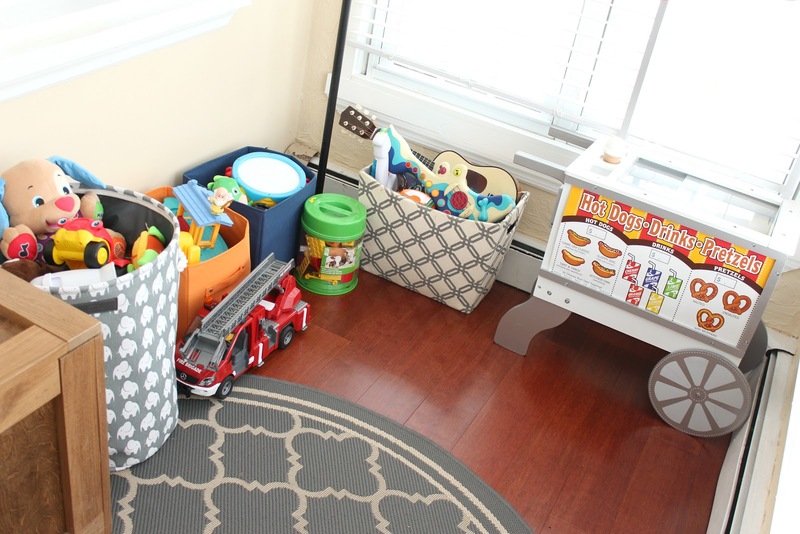 After this Christmas we also designated two bins for each of them to keep some toys up in their room. 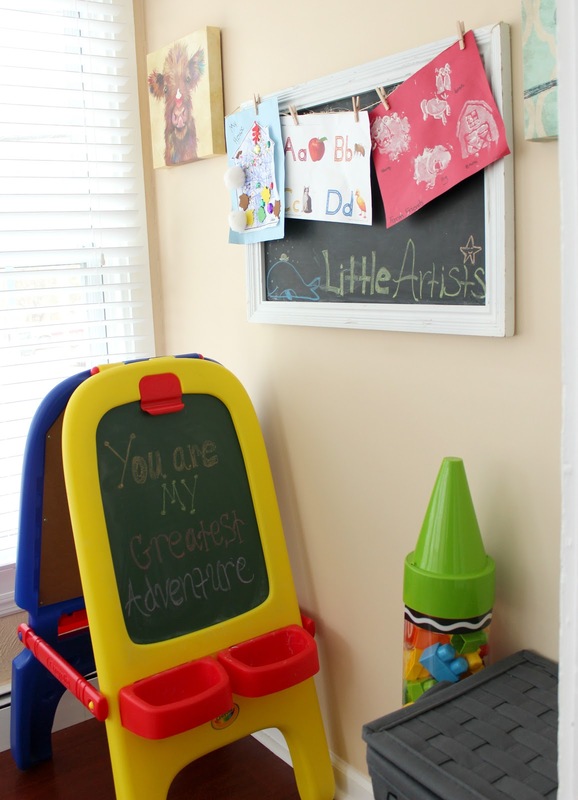 One of my favorite parts of this space is the art area. 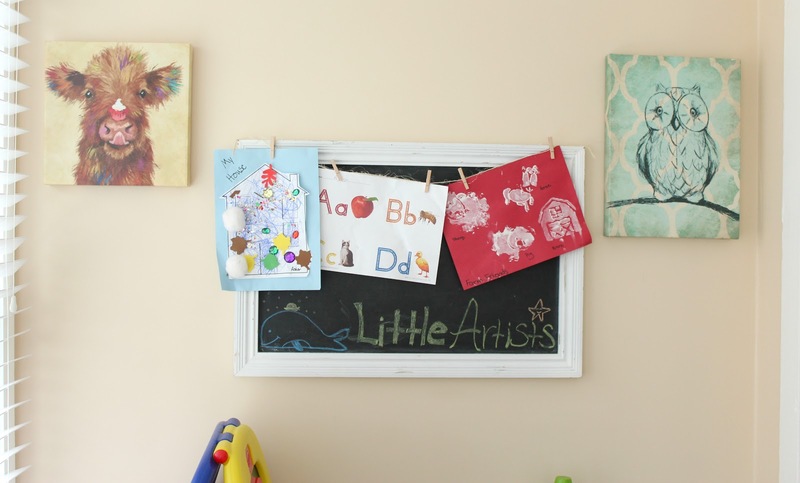 I decided to put up that chalkboard with some string and clothespins to use as a place to hang up and switch out the nuggets artwork. Speaking of artwork, I've grown to love those pictures the boys picked out to go next to the art board. At first I thought they were nuts for insisting that moo cow with the cupcake on her nose was what they wanted. But the more I looked at her, the more she grew on me, and now she makes that wall just perfect. 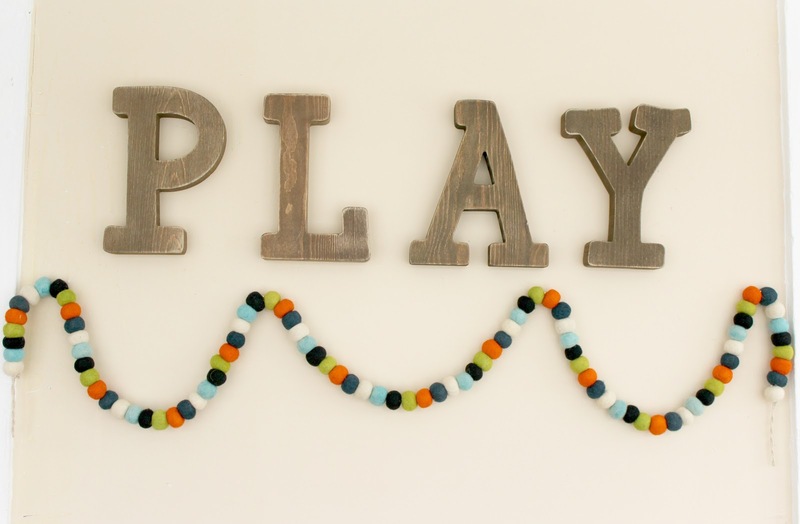 I picked up these wooden letters at Hobby Lobby and came across this fun garland (couldn't find a direct link). All of the garland I was coming across had more of a girly feel to it so when I found this one I knew it was coming home. 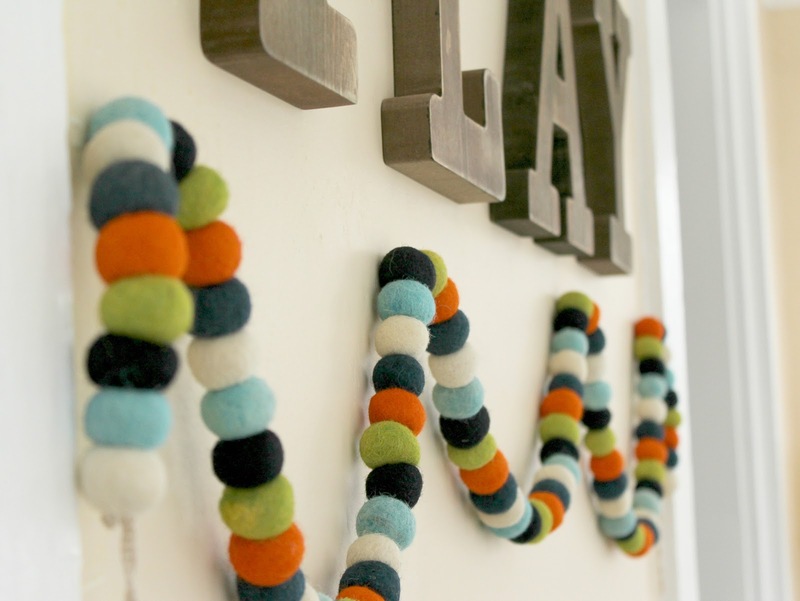 The colors were perfect to give it a more boyish feel all while fulfilling my want for pom poms (win, win). 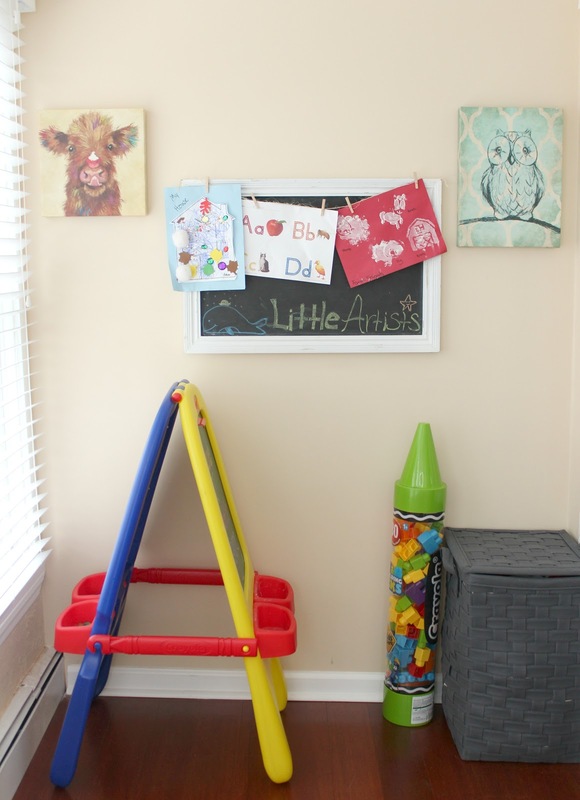 It might not be a dream playroom but it is an area where the nuggets are making memories, having fun, and I can somewhat keep their toys contained.